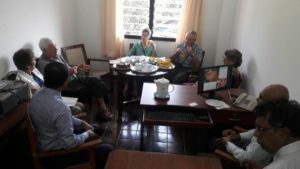 The Charity Trustees had an extremely informative and worthwhile visit to the Oral and Maxilofacial Surgery Department of the Dental Hospital in Peradeniya on January 25th 2018. The purpose of this visit was to learn more about the work done by surgeons who specialise in treatment of oral cancers in children and launch our forthcoming project which will provide specialise equipment for paediatric surgery. The meeting was attended by consultant surgeons of Peradeniya and members of Cancer Care Services who are such important members of the team working with patients in both pre and post-operative periods. Trustees were given an illustrated talk by the country’s leading micro-vascular surgeon and also met a group of patients who had received surgical treatment at the hospital before touring the oncology ward.